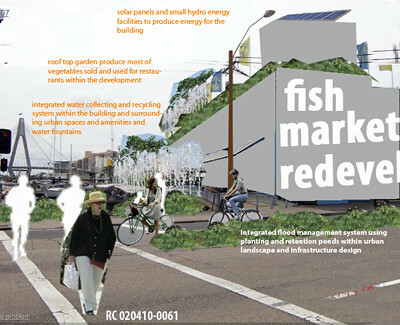 The redevelopment of the Fish Market, along with the opportunities and risks presented through Water Paradox will be the new impetus for the change on our perspectives - that new system, infrastructures and culture could be fostered through the change; and that our urban environments, systems and society continually evolves to adapt to the ever demanding and threatning environmental and social pressures. In essence, the Water Paradox presents us with the realisation that the existing systems, life styles and cultures that we have been developing and living in are not sustainable - that new ways of looking, living, building, functioning and managing of our urban environment is required and that it is POSSIBLE within our capacities of designing and managing our urban environments. 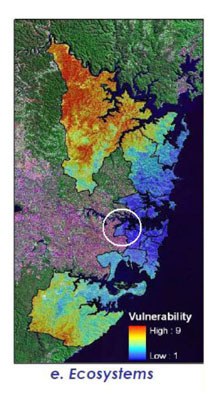 Building urban resilience really is within our capacities through more open outlook and creative ways of looking at our Climate Change issues in relation to the way we live and design our urban cultures, infrastructures and spaces. 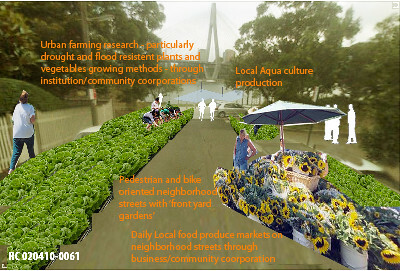 Figure 2: Typical view of the 'front yard farm' streets and the aqua culture farms behind in the bay. 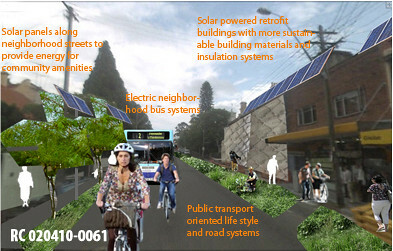 Figure 3: Typical street with 2 vehicular lanes and promoting environmentally friendly transportation modes, such as bus, cycling and walking and buildings, some with solar panels for energy generation and which uses building construction methods that are climate efficient to use less energy within homes. 1. 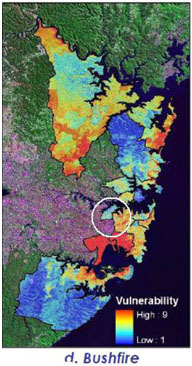 How does Water Paradox impact the way that energy is produced and distributed? 2. 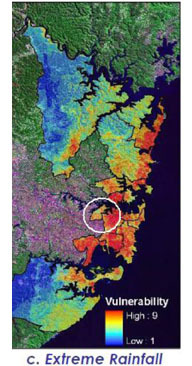 What are the opportunities created by the Water Paradox for energy production and distribution within smaller scales of urban areas? 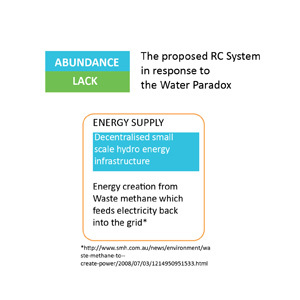 After research and series of discussions, it was evident that the Water Paradox and Peak Oil particularly would have significant socioeconomic impact in relation to power generation and energy supply-- resulting in limited access to energy particularly for the urban poor and the existing energy infrastructure and supply at risk of damage and insufficiency. 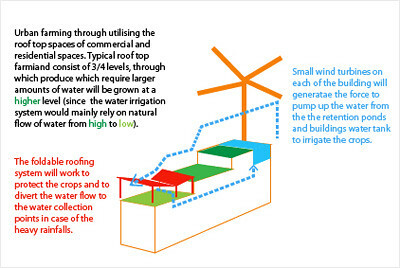 However, it was clear that the Water Paradox could provide new innovative modes of energy production, such as small scale dam/hydro energy, which have been developed and implemented in many developing countries (http://environmentpress.in/2010/03/21/water-and-energy-%E2%80%93-decentralised-small-and-micro-hydro-power-generation-in-india/) which could be the basis of 'decentralised' energy supply and production infrastructure. And that in conjunction with the proposed waste/recycling system, energy production could be made more environmentally and economically sustainable through energy creation through methane. These new infrastructures of energy production could help to provide equitable energy supplies and one which is accessible to every level of urban society for participation in production and supply. 1. 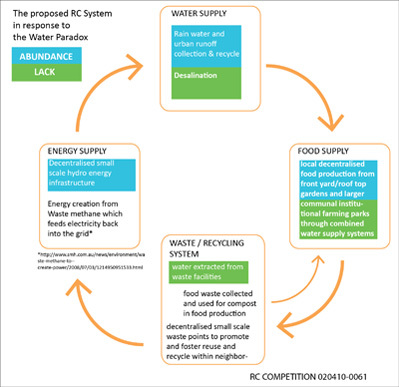 What are the opportunities in which the Water Paradox could positively change the way that the existing waste management could run? 2. 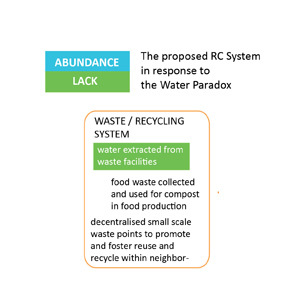 How could waste management, particularly recycling, be made more efficient and socially and environmentally more sustainable within Water Paradox - particularly in regards to the food waste? 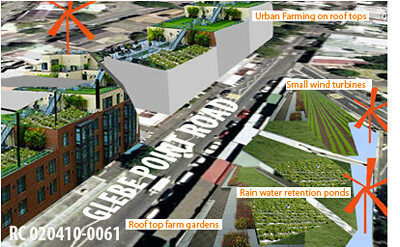 The proposed RC waste system for the neighborhoods are more than just 'waste processing and disposal' facility -- it goes further to promote and implement further 'recycling' culture (in conjunction with the urban farming/food production infrastructure and culture) within scale that is appropriate for units of area covered by the 'decentralised' waste spots. 1. 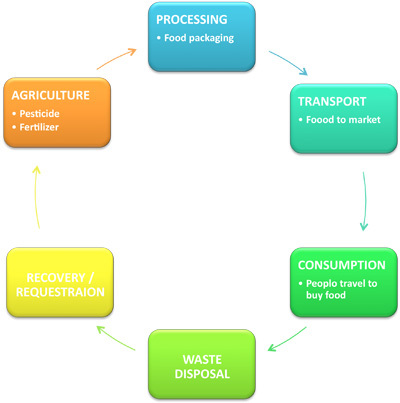 How does the Waste Paradox threaten the way that the existing food supply works? 2. 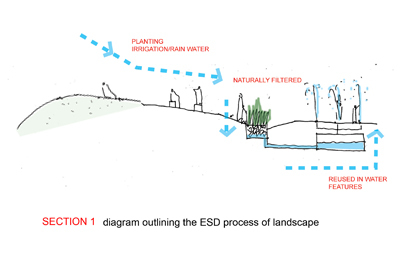 How can we actually take advantage of this 'surplus and lack of water simultaneously' situation and turn it into a more efficient and more socially sustainable system of food supply for neighborhood level? First we analysed the existing food system. 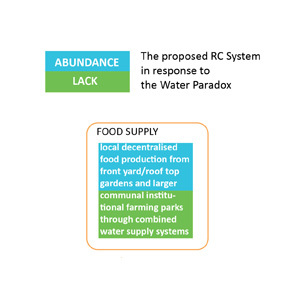 And it became clear that the Water Paradox could provide opportunities in changing the system in which food production and distribution works in providing more efficient and socially, economically and environmentally more sustaianble methods of production and distribution to all levels of the society within the neighborhoods. 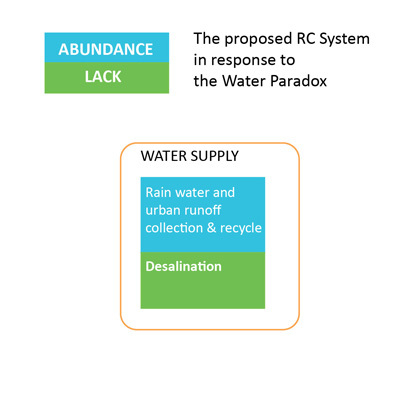 The Water Paradox provides this mixed use area with opportunities to collect the large amount of water resulting from the increase rainfall and urban runoff and at the same time, more need for further desalination processes to mitigate the lack of water. 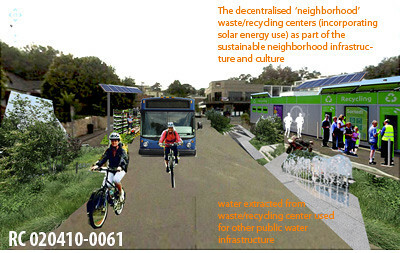 There are opportunities to provide more 'decentralised' water collecting and recycling points throughout the neighborhoods to ensure that each block or units of area covered by each facility is self-sufficient -- in terms of water supply for drinking, daily use, commercial use and also for urban farming for food production. 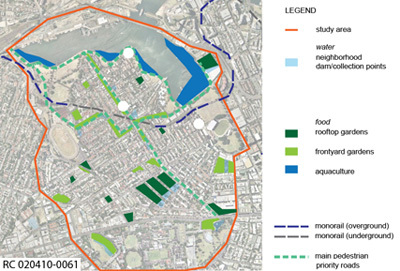 And importantly, more sustainable water management would need to be developed to mitigate and respond to the higher risk of flood and heavier rain and their impact on urban run off and urban infrastructure (using methods of collection/retention as shown on Figure. 3). Water is Life. It's the biny broth of our origins, the pounding circulatory system of the world. We stake our civilizations on the coasts and mighty rivers. Our deepest dread is the threat of having too little - or too much. 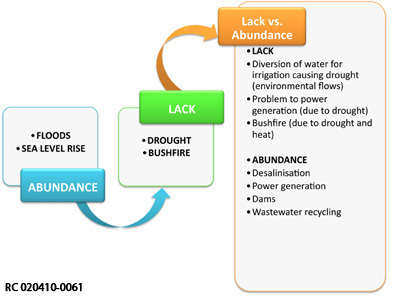 Following the theme of this years competition - Where you live with what you have – our study will focus specifically on the risk and opportunities on the above mentioned climate change induced water issue: the abundance and the lack of water. 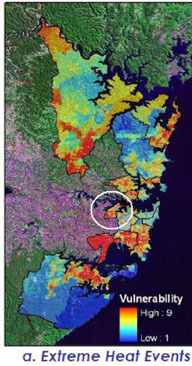 Water naturally was identified as the key issue of the climate change/peak oil induced urban planning problem for the chosen area of study - FIsh Market in Sydney. 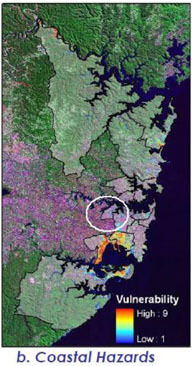 There are three main reasons: one, due to its geographical location in which the area is surrounded by Water - Sydney Harbour and Blackwattle Bay; two, the main key economic and social drive of the area (Fish Market and the harbour) being highly related to water in nature; and most importantly three, due to Australia's high popularity of coastal living and water being one of the key environmental, social and economic concerns of Australia, which is the driest continent on Earth. 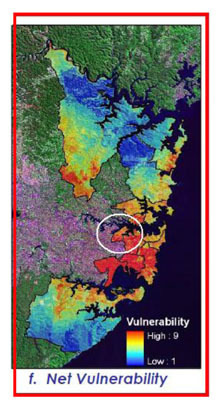 In beginning to explore Sydney's issue of climate change/peak oil induced water topics, it became evident that there was clearly the 'paradox' of water issues -- mostly in extremes of the too much of (the abundance) and the too little of (the lack of) water. 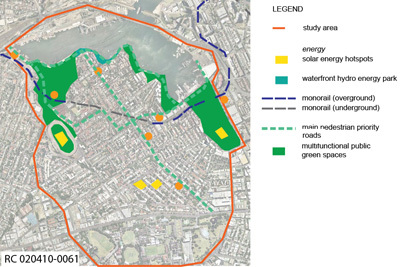 Figure 3: The complex relationship between urban issues (the four focus issues in boxes) identifying the drivers and indirect consequences between issues. 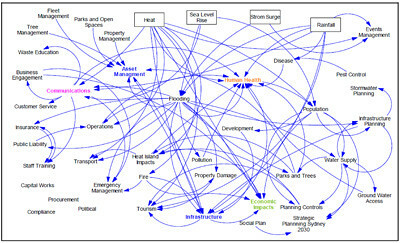 It also became clear that while there were evident 'risks' and 'threats' due to the Water Paradox of Climate Change and Peak Oil, there ALSO were opportunities created through the Water Paradox, which could provide the new innovative ways of designing the decentralised infrastructures, systems and the way that we live in the neighborhoods facing the changes of Climate Change and Peak Oil. 1. 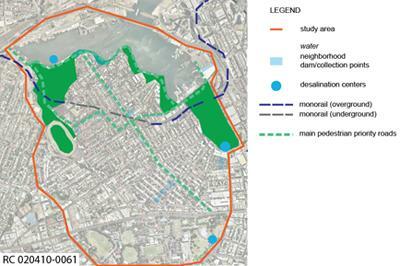 What are some of the major aspects of the urban sytsem that will be significantly impacted by the Water Paradox and how sustainable is it, anyway? 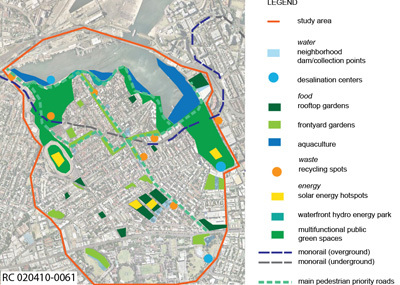 2.Is there a way that these risks/uncertainties/conflicts and opportunities of the Water Paradox could work together to provide more positive impacts on the urban environments? 3. 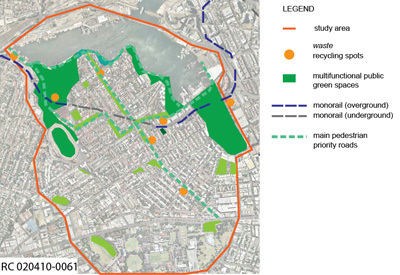 What is important in developing the 'innovative' ways of designing, infrastructures and the way humans interact in their urban environments/systems?